"Stand back, baby mama. We got this." As the episode title implies, our heroes took a backseat, and it was the ladies' turn to save the city from mischief and mayhem. Survey says? Meh. To be fair, this was not a bad episode. There were many things I liked. The introduction of Amunet, played by Battlestar Galactica's Katee Sackhoff being chief among them. Not to mention several laugh out loud moments and drunk Barry. It's just that in an episode that repeated #feminism over and over...and over again, I was hoping for a little more female empowerment. It started off well enough. Mellow bachelorette dinner in progress as third favorite henchman approaches. Neither Iris nor Felicity thinks twice about jumping into the fray and defending the others against the snake-eyed villain. My how things have changed since their respective shows first hit the airwaves. The fact that Caitlin is more reticent is understandable given that Norvok represents the past she was hoping to avoid. 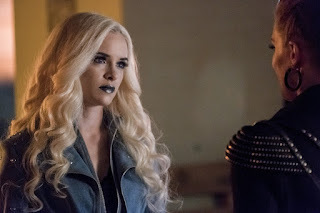 I was also pleased that Frost, I refuse to call her Killer Frost until she earns the name, was quick to explain what's going on to the other ladies. Characters hiding information just to create false conflict is a pet peeve of mine. I know I haven’t mentioned it yet but the fact Iris is now the leader of Team Flash is one of my favorite things about this season, and it takes no time for her to decide that regardless of the packaging, Caitlin/Frost is still part of Team Flash and needs their help. Decision made Felicity figures out how to track Frost, and after another attempt to reach our designated superheroes, the ladies set off to rescue one of their own. This is where the story goes off the rails for me. At first, Frost is hell-bent on finding Amunet and earning the moniker Killer Frost. Then we are treated to whiplash as she tells the others that Amunet is murderous and unstoppable. As for the others, once they realize who they are up against and fully understand how dangerous Amunet is, their plan to go after her and rescue the Weeper is not a smart play no matter what the title of the episode is. The fact they choose to do so after the only meta who could help them benched herself just made matters worse. I know, I know, Frost comes to their rescue in the nick of time but that’s why she should have been part of the plan in the first place. None of these ladies are idiots. I’d like to think they could have come up with a better idea than two ladies waltzing in with super tech guns and a pregnant woman on lookout against a violent meta and an unknown number of bad guys. And I have absolutely no idea what The Powers That Be were trying to say with Joanie’s storyline other than to prove yet again that Joe West is Super Dad. The implication here is 1) Joanie choosing to pole dance was only okay because she was going to write about the experience and 2) the fact that this was not the real reason made it something of which she should be ashamed. Pole dancing is not a job I’ve ever aspired to but the idea that it is inherently shameful does not sit well with me. The rest of the bachelor party succeeds in its aims. There is a legitimate reason why our expected heroes have been removed from the playing field. And with the exception of a few well-timed remarks from Felicity and Amunet, this subplot provides most of the comic relief. It also proves, if there was any doubt, that Dibny might have been invited into the clubhouse but he is not a member of Team Flash. We know that The Thinker/DeVoe created the bus-metas. Until now it was not clear whether he created them or was taking advantage of a situation he knew would occur. We also know he has a specific purpose for each of them which implies that he knew which power they would receive. With a name like The Thinker I knew he was smart but that is several orders of magnitude more intelligent than I gave him credit for. We also have more references to Caitlin/Frost's Hulk-like status. Although, it seems her transformation has more to do with fear than anger. 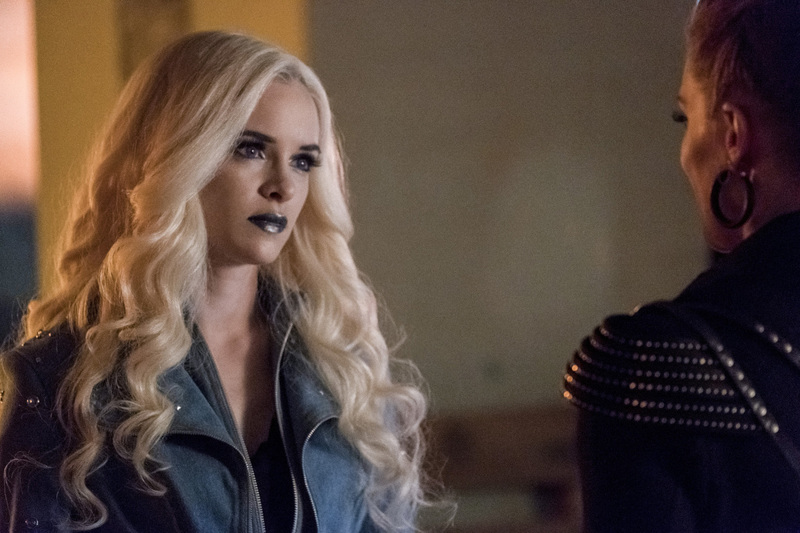 Caitlin seems to have no idea what Frost is up to, but Frost knows all about Caitlin's intentions. Curiouser and curiouser. Also curious is the fact that Caitlin owes Amunet for helping her control Frost but Frost providing muscle is the payment. Huh? If there's supposed to be some deep commentary on the nature of feminism other than to show that women come in all types – mothers and daughters, friends and enemies, heroes and villains, and everything in between, then I didn't see it. However, if this is the only takeaway people glean from the episode, it might be good enough. 2.5 out of 5 pink and blue feather boas. Yet again we had a reference to "This house is bitchin.'" It's not going away, y'all. Barry and Iris's first wedding. One, two, three... Awww! Apparently, they don't lock doors at Star Labs or the West Family Home. As the show keeps proving, Central City is not that safe! How sad is it that Dibny knows the cops in the drunk tank by name? Barry and Iris were quick to tell each other what really happened. Joe and Cecile weren’t. Should I be worried? Good call back to Oliver and Felicity’s fake wedding. I'd forgotten he got shot with an arrow. Cisco: "Meet Barry Allen. Before he met Iris West, before he became an interdimensional time-traveling speedster, he was an adorable baby boy with Ewok-level chub." Dibny: "I assumed this was a superhero hangout and this was a test for my highly attuned detective abilities, which, for the record, nailed it." Felicity: "Girl, you into some freaky stuff." Cisco: "I volunteer to be the designated superhero." Cecile: "Who was that medusa-man?" Felicity: "You know that is not a Cisco-approved name." Amunet: "Did you start a fight? Honestly Norvok, that's why you are my third favorite henchman." Joe: "Cisco, when does this gift of yours stop giving?" Amunet: "Is there any part of the way I’m dressed that leads you to believe I want to be called Ma'am?" Iris: "Well, saving the city wasn't a bad way to spend the night." Yeah, it sort of did start out great but then promptly went off the rails. :) However, the introduction of the absolutely hilarious Amunet was nearly worth it. OMG, love her. I really wish I could tell The Powers That Be that having women on the show doesn't necessarily make it not sexiest, or feminist or gender empowring or that automaticly discuss gender roles or anything like that. They usually make half heart attempts at anything related to this, starting by not giving the female caracters more complex and interesting plotlines. Seriously, there is no problem in any woman having an romantic life of any kind whatsoever - but I was starting to wonder if the writers of this show were aware we have other things going on our lifes. I feel like Legends does a better work in this area than Flash. Ok, sorry about the rant, I've being annoyed with this for three whole seasons and only now I'm seeing a light at the end of the tunnel. Great reaview, Shari! I share your misgivings about Joanie’s storyline. PS: "Why didn't Rose make room for Jack on the door?" got me laughing for days. Rant away! No apology necessary. The problem is that this episode was written by two women (I checked). So why did it feel like they understood the male perspective so much better than the female?? When Barry was drunk I kept remembering what Cat Grant said about the nickname the Flash back in season 1 of Supergirl. Thank the powers tha be that they didn't go there in this episode. So DeVoe is in Central City and in the present timeline. That was not clear from his scenes before the episode, I kept thinking his place looks like something from the future or maybe another Earth. HAHAHAAHHAHAHA I do remember that scene on the movie, but I love the jokes about this scene. PS: I only now realized there are a lot of misspelled words on my comment. Sorry! Patryk, you're evil. Now I'm going to have to do a Supergirl rewatch! I'll let Cisco give me my supervillian name.